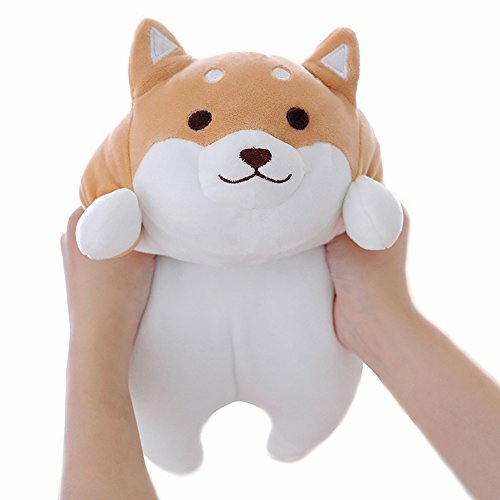 I am a soft shiba inu that feels very elastic and is the best gift for children, couples and friends. You can see me in every place you like, suitable for bedroom, living room, family, office, etc. ★Office pillows: ease work fatigue and give you a relaxing moment. ★Freetime dolls: Watching opera artifacts on the sofa is an indispensable warmth for you. Winter is no longer cold. ★Cute design: cute face, cartoon eyes, round bottom, vivid shape, bring you a warm and comfortable experience. ★Material: high quality plush, comfortable and flexible, delicate touch, filled with full, not easily deformed. ★Size: Corgi dog size 15 inches (38cm), full length from nose to leg. When measuring manually, allow 0.1-0.3 inch error. ★Care instructions: Can be washed, remember not to bleach. ♥The cute Shiba Inu plush pillow is the best gift for children, couples and friends. ♥Suitable for bedrooms, living rooms, homes, offices, nursery beds and every place you like. ♥I am a soft, chubby Corgi, very elastic, can hold me, pressure me, and when you are in a bad mood, you can hit me. ♥High quality plush, comfortable and flexible, delicate touch, filled with full, not easily deformed. ♥Size: 15 inches (38 cm) . If you have any questions about this product by Levenkeness, contact us by completing and submitting the form below. If you are looking for a specif part number, please include it with your message.